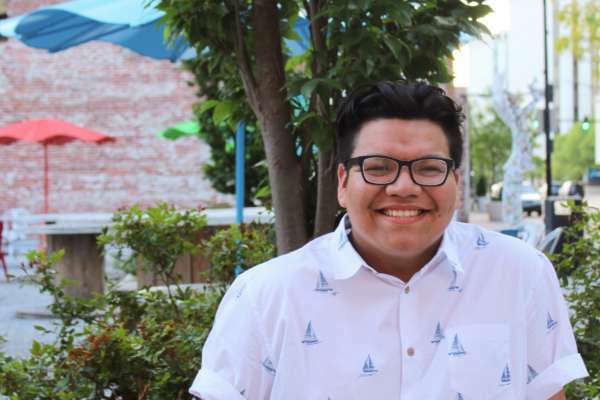 First generation student Julian Ibarra is a freshman BFA acting major. One of the most obvious differences would definitely have to be my lack of access to financial resources. I’ve noticed that a majority of students on campus come from middle to upper-middle class households who have parents or family members that are financially capable enough to provide them with money, a vehicle, supplies and other resources to support themselves for the first few years of college. I knew my parents wouldn’t be able to support me as much as they could going into college, so I made sure to apply for a job on campus in order to have some sort of consistent income that allowed me to fulfill my own needs while living independently. As far as applying to OKCU goes, most of the drive came from me personally. As soon as I received my Clara Luper scholarship award and acceptance into the School of Theatre, I knew that OKCU was where I wanted to enroll. My support system back in Wichita is my nuclear family (parents and siblings), and a few close friends. Additionally, I’ve discovered another support system here on campus—my friends from the 5th Floor of Walker Hall. Living and learning with them thus far has been so rewarding because they have helped me develop a strong patience for others while remembering to spread as much love as possible. I’m proud to say that I have a family I can rely on away from home, too! I would like people to be mindful of any prejudices or misconceptions they may have regarding first-generation students. First-gen students are often stigmatized for being less qualified and unnecessarily pitied by others, but that is seriously not the case. Many of us do not let our backgrounds and upbringing define us, but instead use it as a source for strength.